THE UNITED GENERAL GAS CO. HAPPY WITH THE WAY THE "ARDRI" WORKED THEY BOUGHT THE "BRAEDALE" (ex. 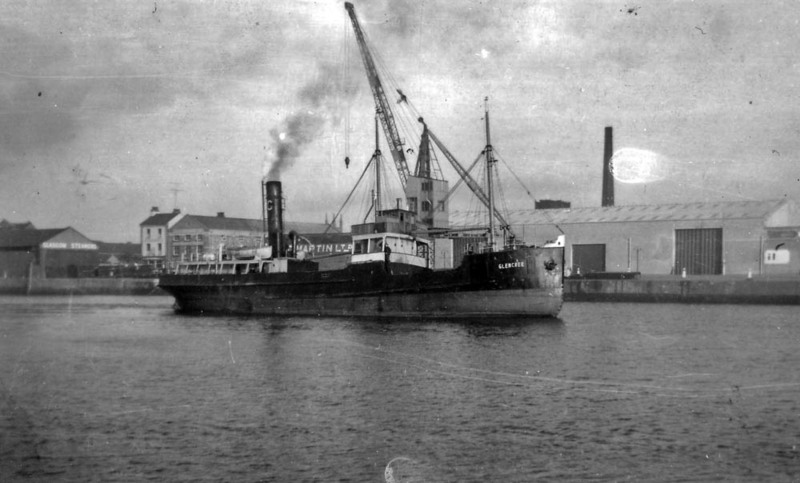 "BESSIE BAR" 400 TONS 1894 OF GLASGOW ) SS Braydale was bought on 8/1/1918 cost £25,000.00 FROM THOMAS COLLIER OF WICKLOW IN 1918. 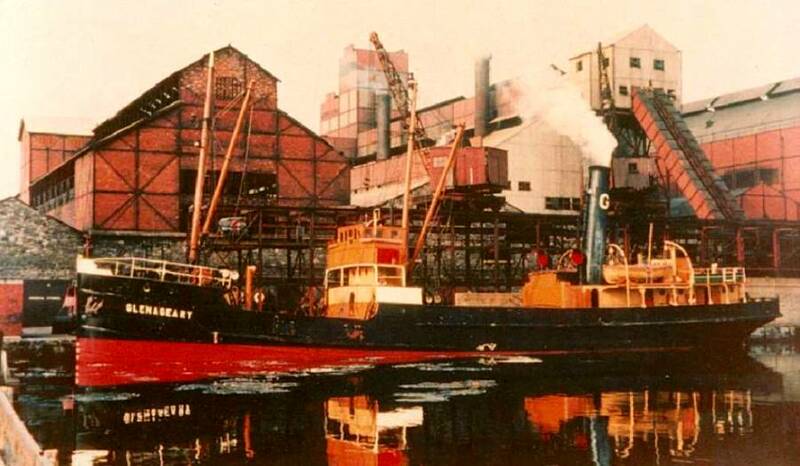 BECAUSE SHE WAS SLIGHTLY SMALLER THEN THE "ARDRI" WHO HAD TO USE SIR JOHN ROGERSONS QUAY, SHE COULD USE THE GRAND CANAL LOCKS AT RINGSEND TO GET TO THE COMPANY'S DEPOT BETWEEN HANOVER AND CHARLOTTE QUAYS. 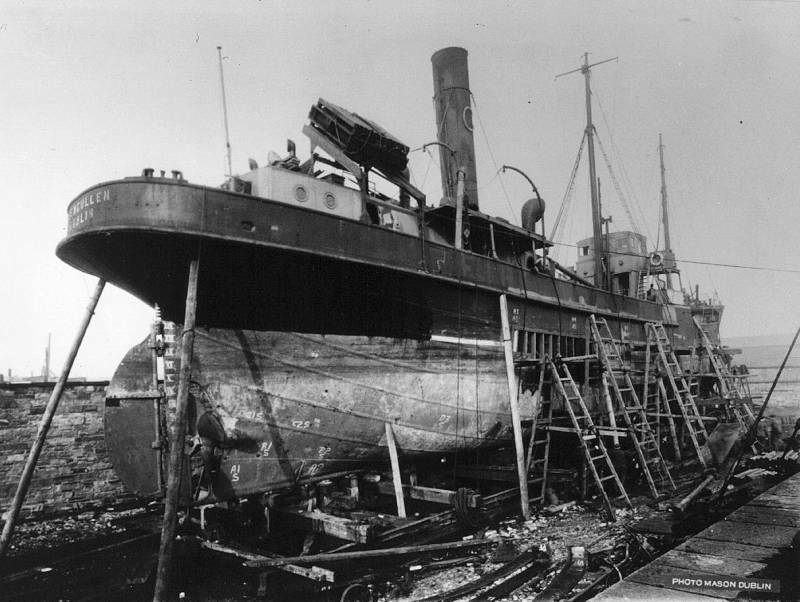 THE NEXT SHIP PURCHASED WAS THE "GLENAGEARY"(1920 460 TONS) BY THE LYTHAM SHIPBUILDING CO. OF LYTHAM, WHO ALSO BUILT THE "GLENCULLEN"(460 TONS) 1921 FOR THE COMPANY. 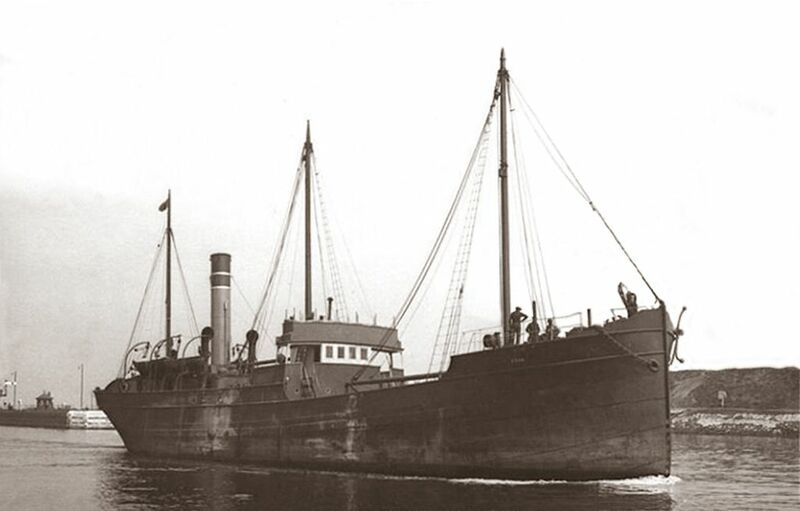 AFTER THESE SHIPS ENTERED SERVICE THE "BRAEDALE" WAS SOLD IN 1920 WITH THE "ARDRI" FOLLOWING IN 1923. Robertson Glasgow. 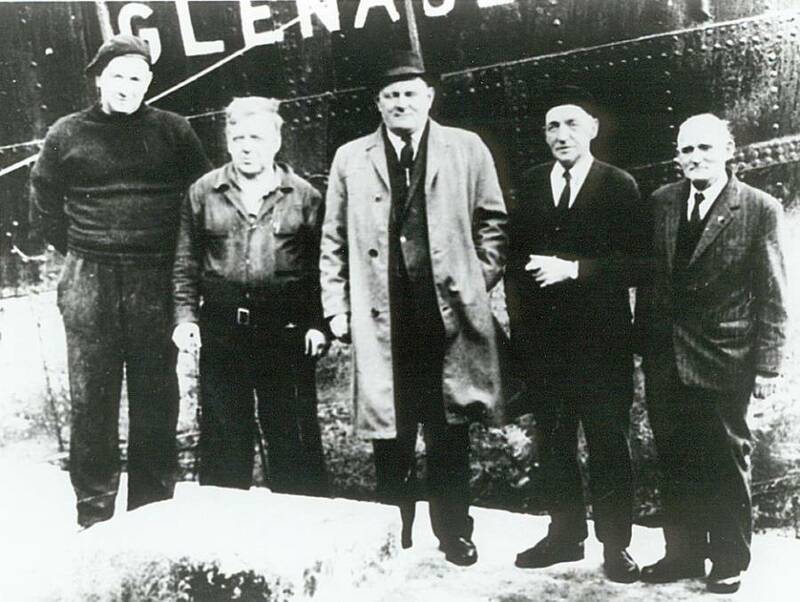 Called "Gem Line" in later years. 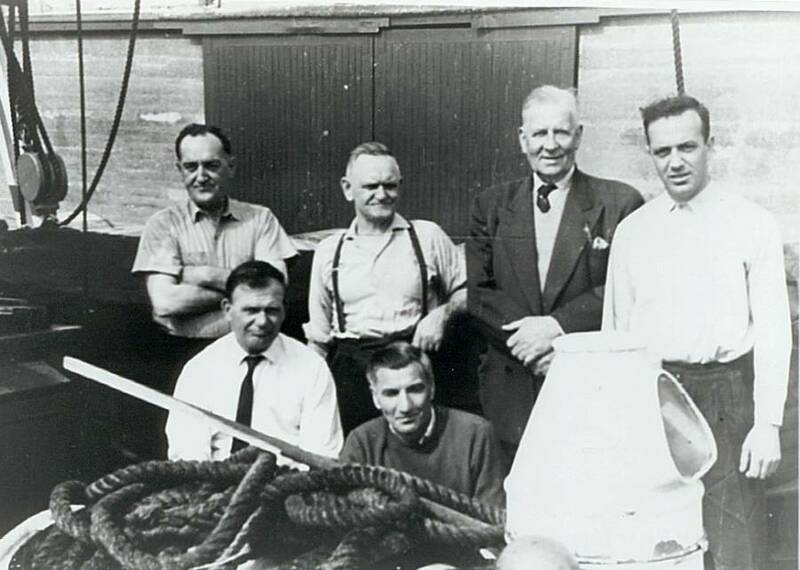 Glenagarary 1962. 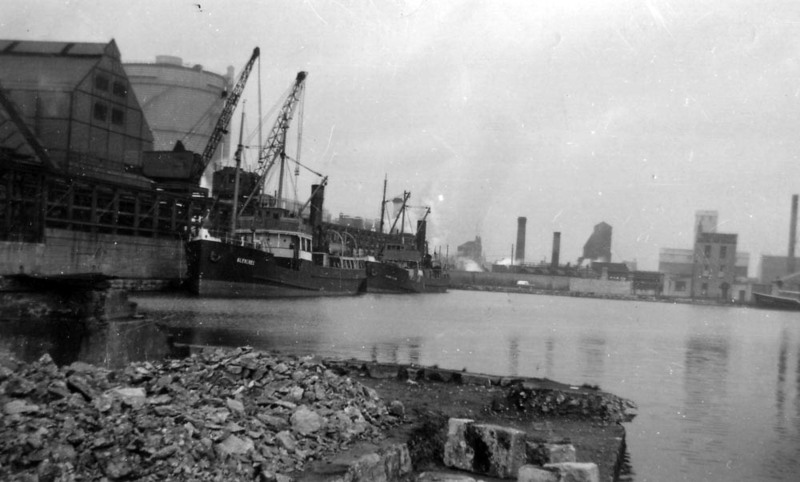 Glenbride-Glencullen 1962 gas works in the basin Glenbride-Glencullen entering the Basin 1962. Glencree Passing the ferry steps 1962. Glencullen Passing the ferry steps 1962. 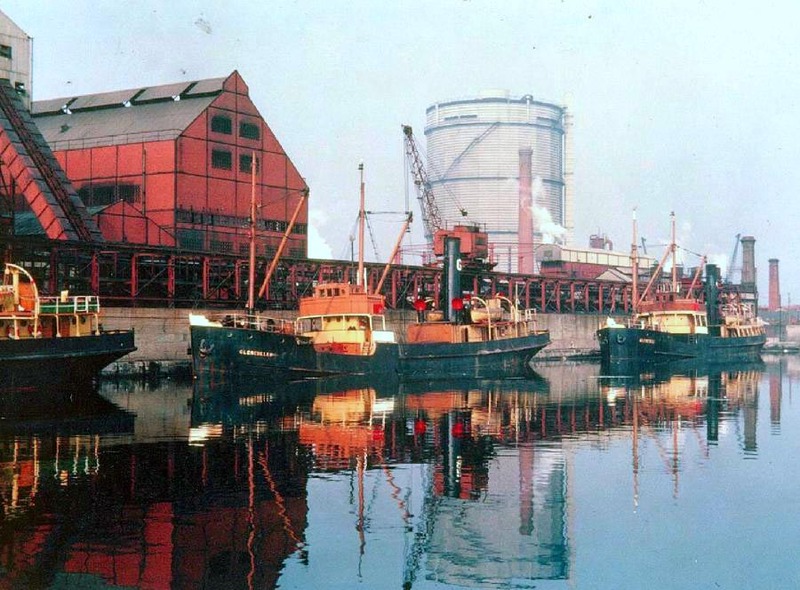 FROM THE 1920s TO THE 1930s THE SHIPS TRADED FROM DUBLIN TO LIVERPOOL TAKING 16-18hrs. TO COMPLETE THEIR RUN NORMALLY WITH A CREW OF 11. 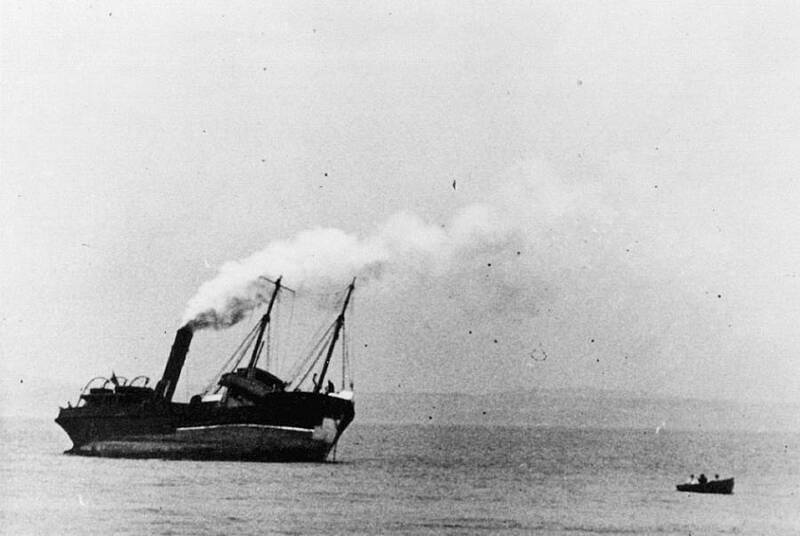 DURING THE SUMMER MONTHS WHEN ONLY LIGHT SUPPLIES OF COAL WERE NEEDED , THE SHIPS WOULD BE CHARTERED OUT TO TAKE OTHER CARGOS AROUND THE COAST AND ACROSS TO LIVERPOOL. 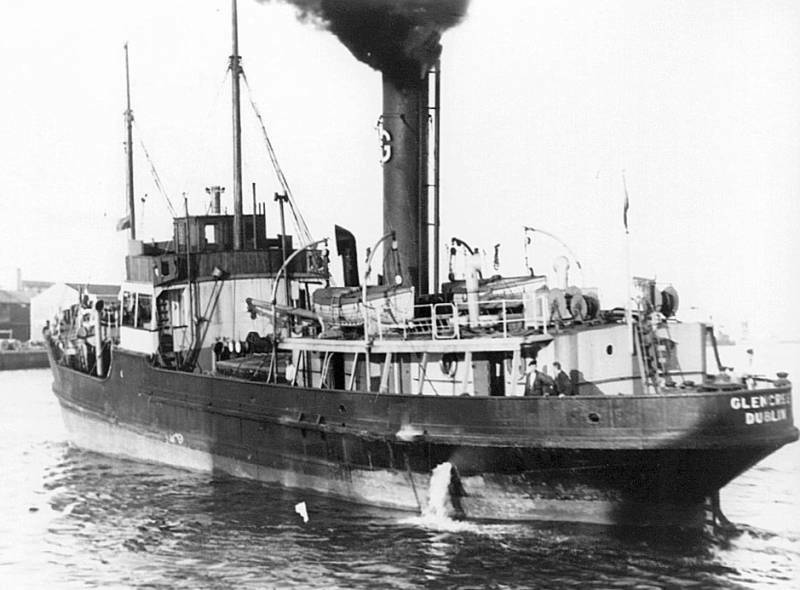 DURING THE 1930s BECAUSE OF ECONOMIC DIFFICULTIES BETWEEN IRELAND AND BRITAIN THE "GLENCULLEN" MADE SOME RUNS TO ROTTERDAM FOR CARGOS OF COAL. 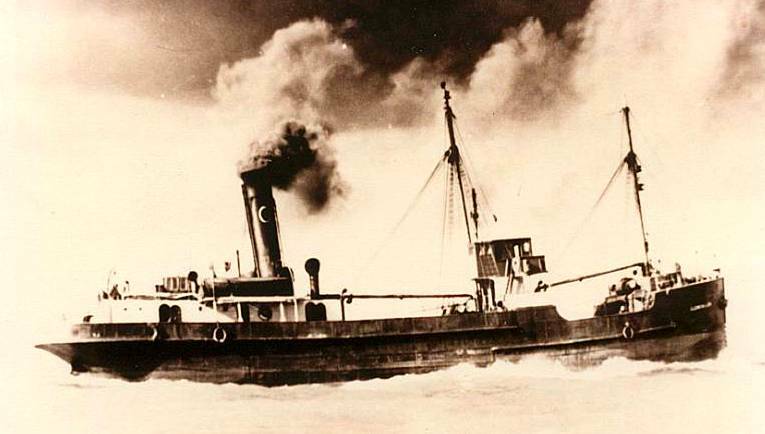 SHE WAS THE ONLY GAS CO. SHIP TO MAKE CONTINENTAL RUNS. 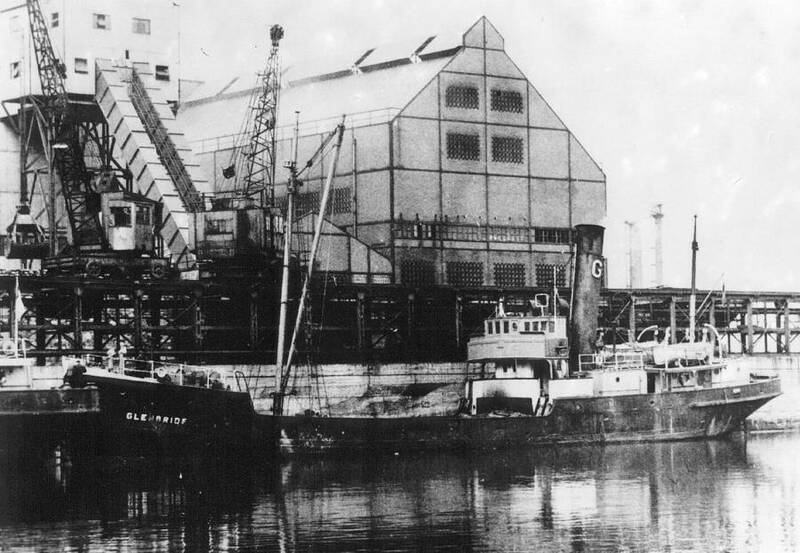 IN 1934 THEY PURCHASED THE "GLENGREE"(480 TONS) S.S.GLENGREE FROM THE VICKERS IRE. CO. AT DUBLIN DOCKYARD. AT THE OUTBREAK OF THE 2nd. 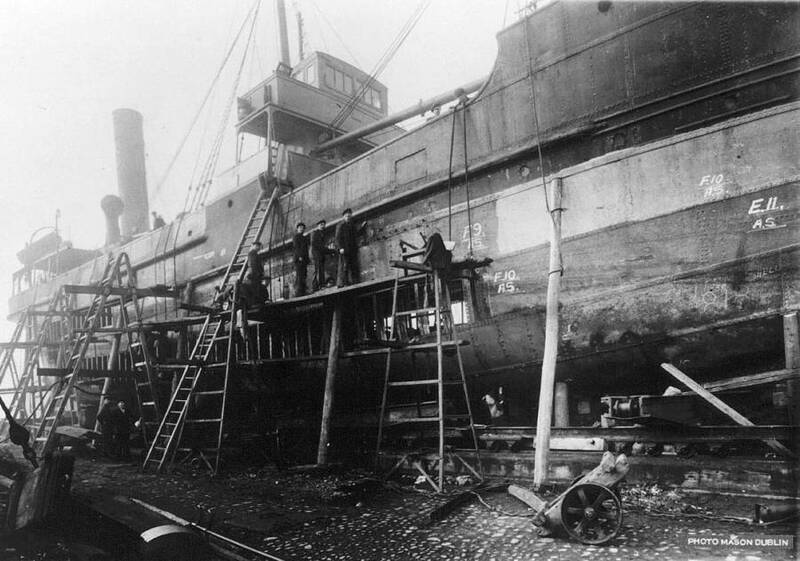 WORLD WAR THE COMPANY'S STOCK OF COAL WAS PLENTIFUL BUT THIS SOON CHANGED AND THEY DECIDED TO ADD A FOURTH SHIP TO THEIR FLEET. THE "GLENBRIDE"(ex. 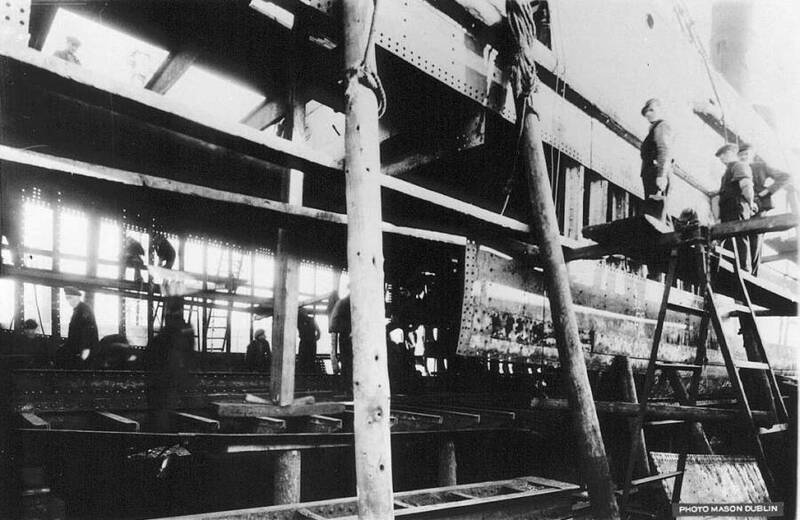 "MORION" 440 TONS 1919). 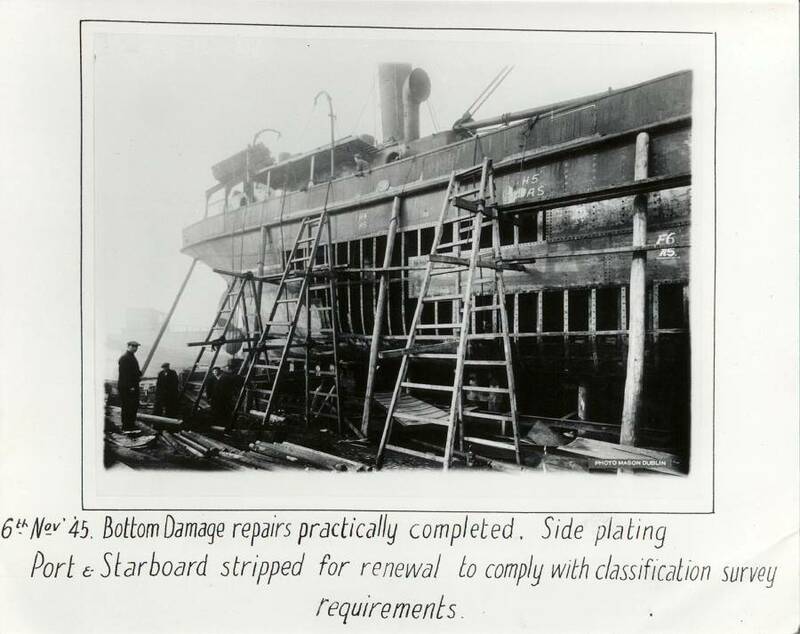 SHE REMAINED ON CHARTER TO THE COMPANY TILL 1949 WHEN THEY BOUGHT HER OUTRIGHT. 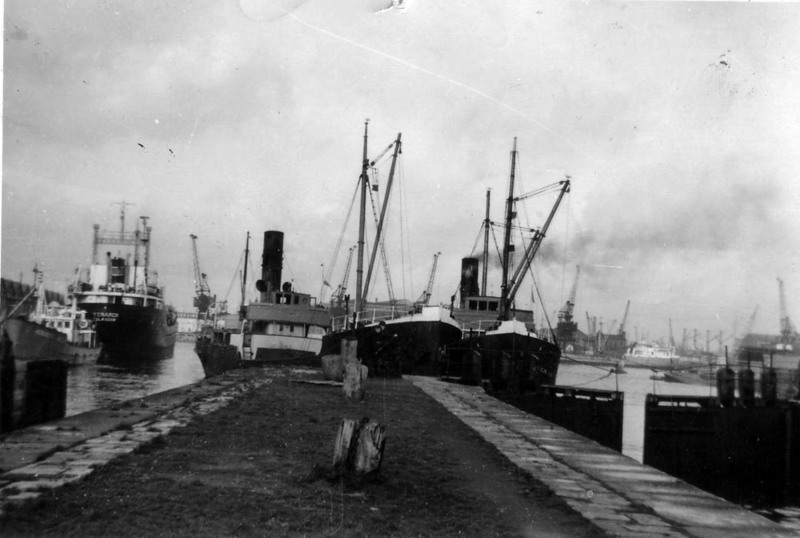 DURING THE WAR THE COMPANY'S SHIPS CONTINUED TO TRADE ACROSS THE IRISH SEA, ENABLING DUBLIN AND OTHER PARTS OF THE COUNTRY TO USE GAS FOR THE ENTIRE PERIOD OF THE WAR . 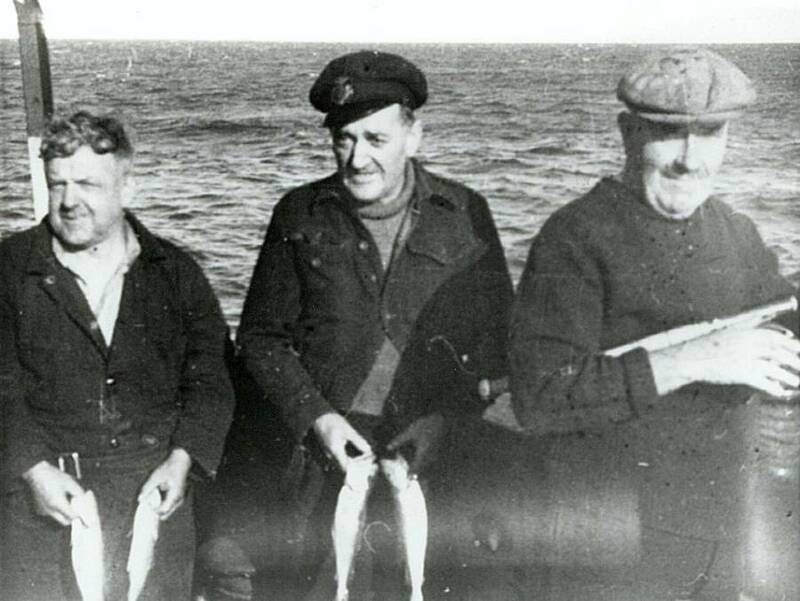 ON A FEW OCCASIONS THEY WERE ATTACKED BY GERMAN AIRCRAFT. 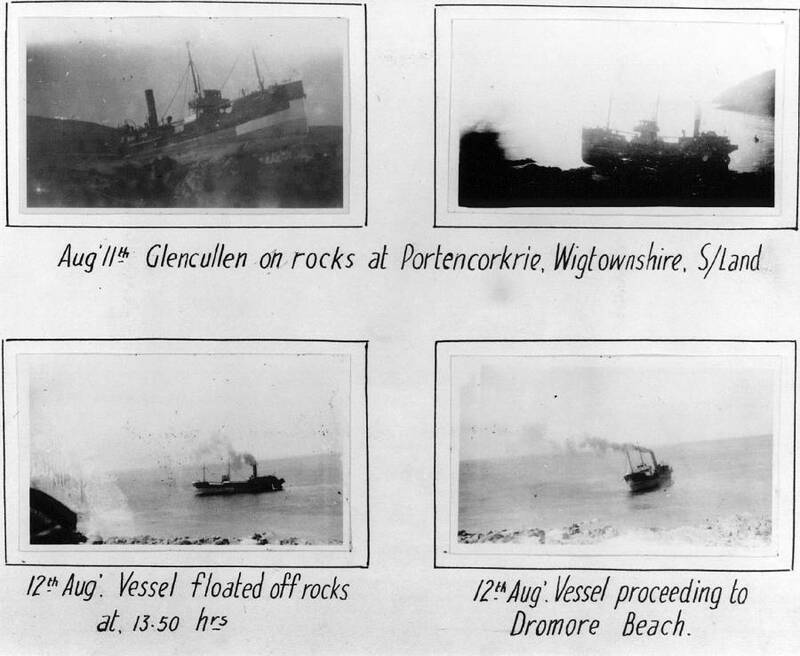 THE "GLENCULLEN" AND THE "GLENGREE" WERE BOTH BOMBED AND MACHINE GUNNED. IN 1941 2 ENGINEER'S WERE WOUNDED ON THE "GLENGREE" BY MACHINE GUN FIRE FROM GERMAN AIRCRAFT, THE CHIEF ENGINEER W.BROWN AND THE 2nd. ENGINEER M.MOORE. BOTH SURVIVED. 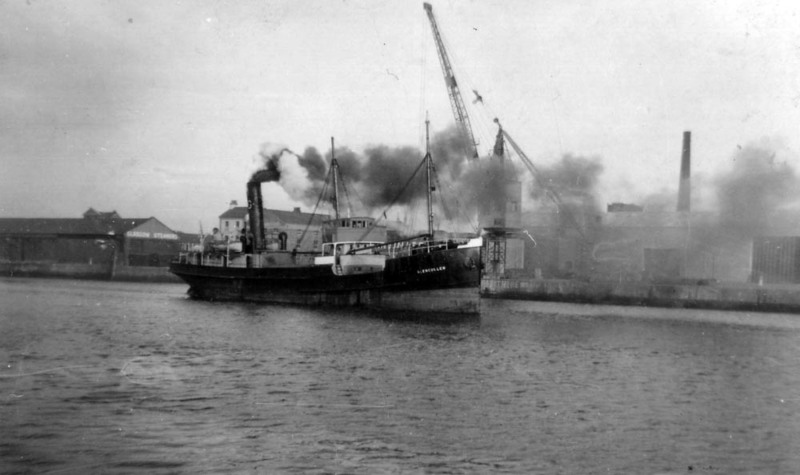 "A LOT OF CREDIT IS DUE TO THESE BRAVE MEN WHO KEEP DUBLIN SUPPLIED WITH GAS DURING THE WAR"
"TO THE MEN WHO WORKED THESE SHIPS AND THE SERVICE THEY PROVIDED TO THEIR COUNTRY, ALONG WITH OTHER SEAMEN FROM THE DIFFERENT SHIPPING COMPANY'S WHO ALSO RISKED THEIR LIVES TO KEEP THIS COUNTRY SUPPLIED WITH FUEL AND FOOD DURING THE WAR we owe them a great debt. THEY HAVE STILL TO BE FULLY RECOGNISED BY THE GOVERNMENT OF TODAY AND GOVERNMENTS PAST". 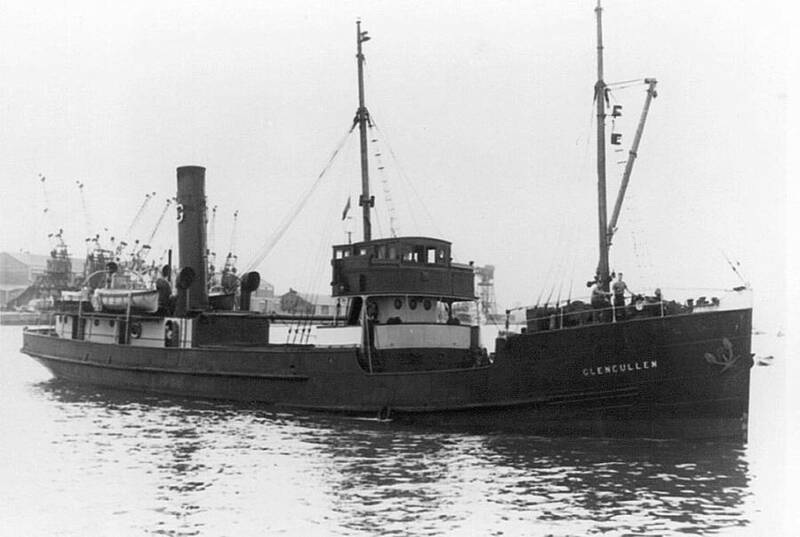 AFTER THE WAR THE SHIPS TRADED SUCCESSFULLY TILL THE 1960s WHEN THEY WERE REPLACED BY 2 MOTOR SHIPS THE "GLENCULLEN" 11 (ex. 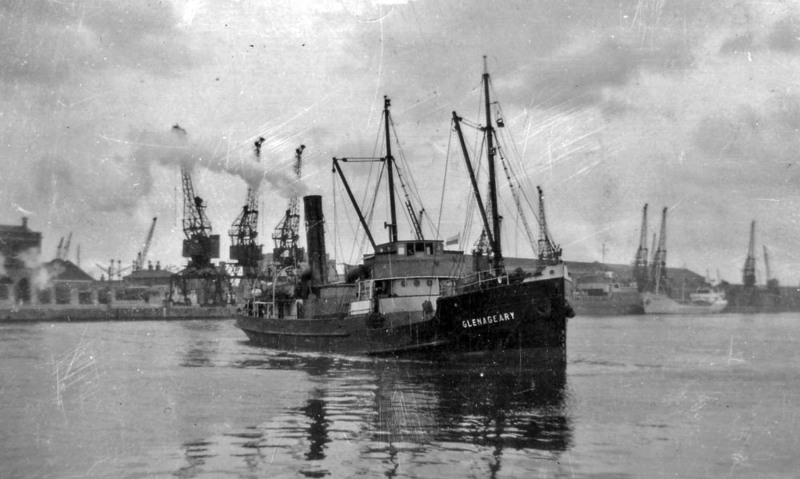 "WALCHEREN" 440 TONS 1952) IN 1963 AND THE "GLENBRIDE" (ex. 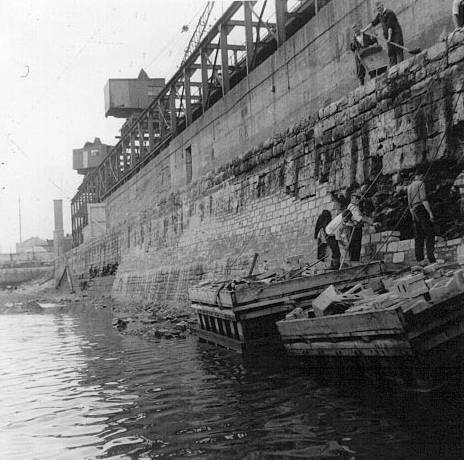 "LADY SYLVIA" 371 TONS) ALSO IN 1963. 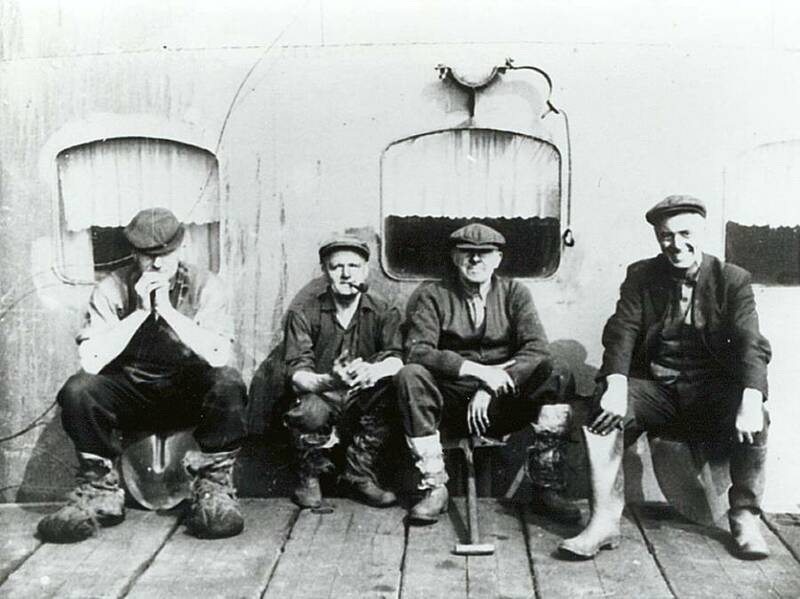 THEY CARRIED COAL FOR THE GAS COMPANY TILL 1968 WHEN THE COMPANY CHANGED OVER TO OIL AND THE SHIPS WERE MADE REDUNDANT AND LATER SOLD. 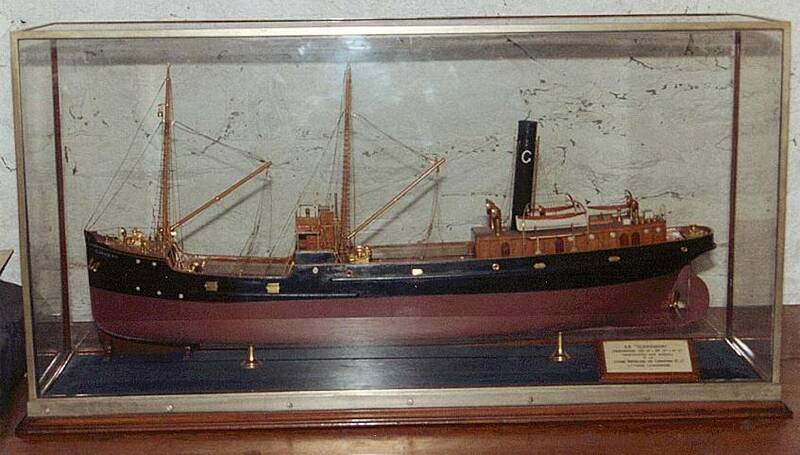 THE "GLENCULLEN" WAS SOLD TO THE THOMAS WATSON SHIPPING CO. OF ROCHESTER AND RENAMED "LADY SABINA" SHE WAS LAST HEARD OF AS THE "MUMTAZ" OF DUBAI IN 1998. 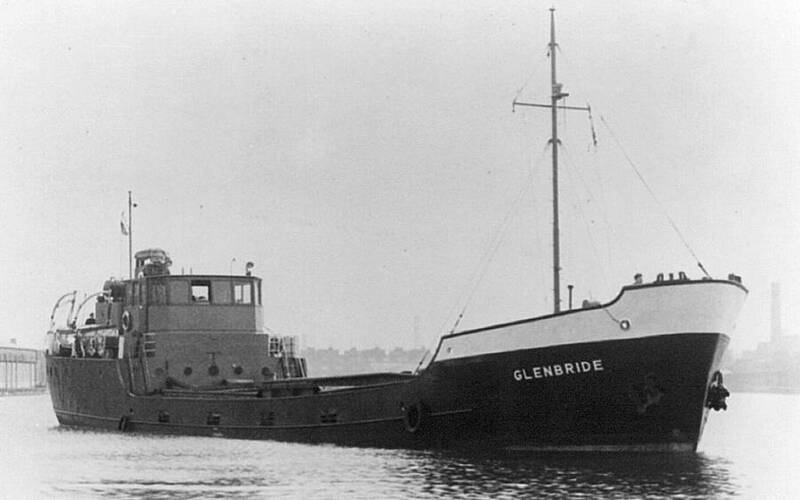 THE "GLENBRIDE" WAS SOLD TO ALDERNEY SHIPPING CO. AND RENAMED "ALDERNEY TRADER", LAST HEARD OF AS THE "MEMI" AND USED AS A PONTOON IN ST. MALO FRANCE. 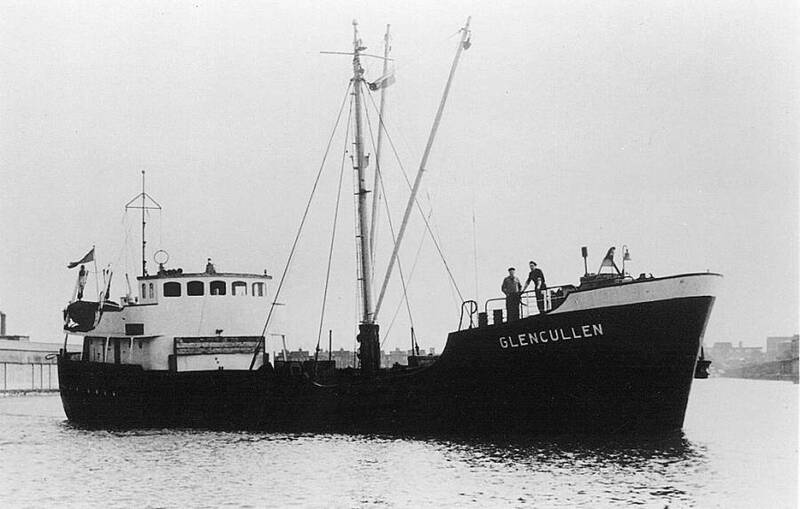 IN 1945 THE "GLENCULLEN"RAN AGROUND ON THE MULL OF GALLOWAY. 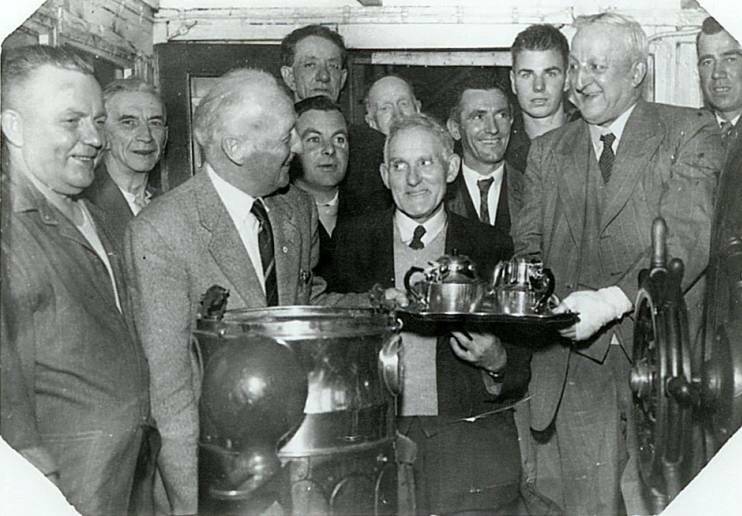 Patrick Connolly from Ringsend , centre. 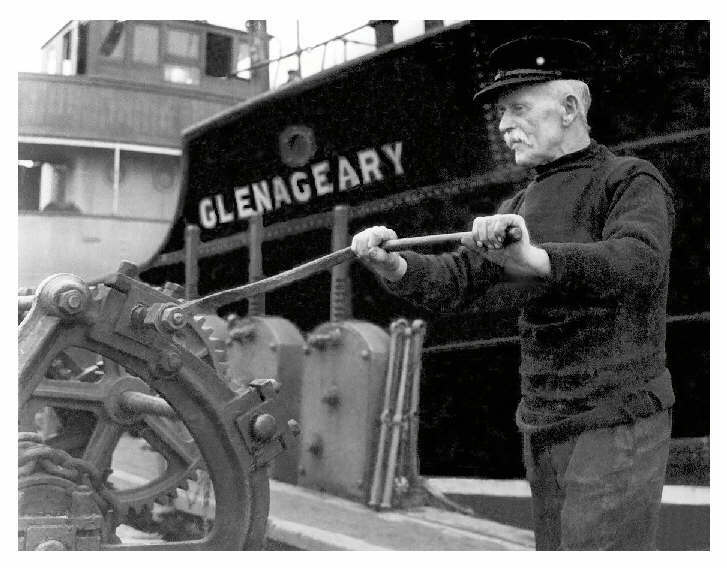 WHO SKIPPERED THE GLENAGEARY IN THE 1950s. IN THE MIDDLE IS CAPT. James H Stewart. WHO SUPPLIED ALL THE PHOTOS AND A LOT OF THE INFORMATION ON THIS PAGE.